Ever had a dream of becoming a World Record Holder? We are giving you an opportunity of a lifetime; Be a part of it and don’t repent later! All you need to do to become a world record holder is to be part of the largest information security workshop E-HACK. E-HACK is an Information Security Workshop, organized by InfySEC. The workshop aims at creating awareness about INFORMATION SECURITY by showing in what all ways information or data can be stolen.Meddle in cyber-warfare, battle with our machine master mind who will throw challenges on web application security, network security, algorithms, reverse engineering and decryption. The team which cracks the final level will attain the glory of being Winner at our E-HACK Guinness World record attempt with tons of prizes waiting. Be simple but not simpler is the famous quote by Einstein, that’s secret of success for E-HACK. Heard of CTF (Capture the Flag)? We are going to have an Online CTF where you will have to showcase your skills in by passing security systems to claim top honors. The only way to know how to protect our information is by knowing the ways in which it can be stolen. So, we’ll be having wide range of discussions on what all ways a HACKer can get his hands on your information and in what all ways you can thwart him. Be prepared for a jaw dropping, entertaining and educative learning experience. This is a great networking opportunity for the security enthusiasts and ethical HACKers across the country to have intense knowledge sharing sessions. Apart from that, live demonstration, hands on experience on the latest tools, capture-the-flag competition and various other technologies will enable you to discover and contribute to make the world a secure place to live in. E-HACK is a 2 day event. Starts on 27th July 2013(Saturday) and ends on 28th July 2013(Sunday) at Chennai. The first day will begin with the registration at 08.00 followed by breakfast for all. After breakfast, the keynote of the event will delivered and the instructions, rules and regulation of the event will be explained. Then the Record Clock will be officially setup at 09.59 and after that the training begins. The participants will be trained in the various aspects of HACKing by industrial experts. The training ends after lunch at 19.30. The registration for the event will be closed and the registration for the CTF will start after dinner at 20.00. Overnight CTF starts around 21.00 with live scoreboard which will constantly track which team is leading. The entire night will be activity filled. The game will continue into the second day and will end by 09.00 (Don’t even think about sleep!! We bet you can’t!) After this point CTF can’t be attempted. The experts provide CTF demos after it ends and will explain all the levels. The clock ends at 10.30 with which E-HACK comes to an end. After 10.30 every single person in that room will be a record holder.Ain’t that cool? After CTF closes, the experts and our eminent speakers will address the gathering regarding Information Security. Results of CTF are announced at 10.50 and Grand prizes are distributed. The entire event comes to an end at 11.00. The event is going to be graced with the presence of various eminent personalities and industrial experts to share their views and thoughts about Information Security. We are going to have Mr. Shiva Ayyadurai, Inventor of EMailTechnology , Mr.PatrickMartinent from Google Development team, India , Dr.Prateep Phillips, ADGP of cyber Crime Branch Division, Chennai, Dr.SanthoshBabu, IAS, Commisioner Indian Medicine , Mr. SanthoshSrinivasan, Ex-Director of Symantec, Mr.Karthikeyan, Business consultant and Innovation Expert as speakers for this 2 day extravaganza. As far as the eligibility for the event is concerned, if you have been to high school and have huge interest to showcase your skills or interested in learning new things, you can be a part of E-HACK. Just bring a laptop with a decent internet connection. Can’t come down to Chennai to be a part of the event but have a huge group of enthusiasts?? No worries, physical barriers are no excuse for you to be a part of the event. Collect the group, contact and us and be an Organiser of E-HACK Xtended in your own locality. You can have live webinar and what more; you can also be a part of CTF and a part of history. This event, E-HACK, is going to be the largest ever workshop on information security in 2013. On its way, we are also attempting for some records. 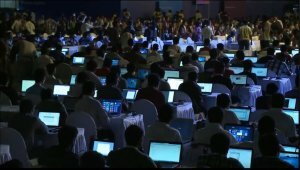 MICROSOFT holds the record for most number of participants in a software development marathon in a single location, by having a head count of 2567 participants. We are going to beat that record by having 3000+ participants in a single venue. This event is going to be an attempt for a record, in The Indian Book of Records, The Asian Book of Records and The Guinness Book of World Records, as the event with the largest number of participants in an information security workshop. Don’t be a part of History; Create History, with us! The event also aims at helping people grow along with us. Any company that wants to have a product launch or expand their business; they can just be our event sponsors and have a huge reach. The brand value and image of the sponsors can be easily boosted as they have a chance to publicize themselves among the 3000+ students participating in the event. Apart from this, we also have a huge following base online, so your brand can have viral publicity. Imagine a reach of 3000+ target audience overnight! That’s what we are offering you! P.S: World renowned web security experts will be watching you at E-HACK, who knows you might end up working for them. Prove you’re potential.